Improving Mouth Care is an e-learning package to support the training of all healthcare professionals involved in mouth care. 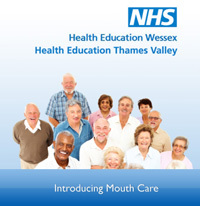 This free resource developed by Health Education Thames Valley and Wessex introduces the basics of oral health care. It has been designed to give health and care staff advice and guidance in order for them to provide evidenced based mouth care for their patients and clients; with the intention of ensuring that they can enjoy the benefits of good oral hygiene and oral health as part of general health care. Why is oral health care important? Oral diseases are among the most common non-communicable diseases in the UK and worldwide, despite being largely preventable. Oral health is an important part of general health and wellbeing. It allows people to eat, speak and socialise without discomfort or embarrassment. Numerous studies have shown links between poor oral health and diabetes, stroke, heart disease, lung disease and dementia. Poor dental function also results in a lower intake of nutritious food, more intestinal problems, increased drug intake and ultimately a lower life expectancy. Dental pain and infection impair cognitive function which may already be reduced in adults with a learning disability or elderly people, especially those who have dementia. Aspiration pneumonia is the fourth overall leading cause of death in hospitals. Many cases of bacterial pneumonia are caused by bacteria from the mouth or throat. Effective mouth care will help to reduce the number of bacteria retained in the mouth and studies have shown a decrease in the incidence of hospital and care home acquired pneumonias as a result. Introducing mouth care – Aimed at first year pre-registration nurses and care staff working in the community. This session has simple, retainable advice on mouth care with guidance suitable for Health Care Assistants. 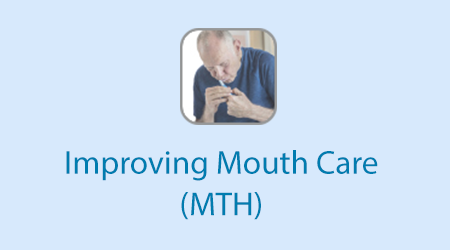 Mouth care for adults – Aimed at providing additional material for nurses responsible for assessment and care planning, covering systemic diseases and extended content on how to support individuals with dementia or diminished capacity. Mouth care for people with additional needs – suitable for staff looking after people with more challenging oral health issues and/or behaviour that makes mouth care difficult. The format for each session includes pictures and videos with additional links to evidence and further reading. All three sessions have an assessment with a pass mark of 80%. This resource is patient centred, and is mapped to Care Quality Commission standards. It also follows best practice as part of Essence of Care and NICE guidance. All the recommendations are based on “Delivering Better Oral Health – An evidence-based toolkit for prevention” – 3rd edition by Department of Health and the British Association for the Study of Community Dentistry, published June 2014. If you already have an account with e-LfH, then you can enrol on to the Improving Mouth Care programme by logging in to the e-LfH Hub, selecting My Account > Enrolment and selecting the programme. You can then access the programme immediately in the My e-Learning section. To register for the Improving Mouth Care programme, select the Register button. Select the option ‘I am a care home or hospice worker’ then enter your care home / hospice name or postcode and select it from the options available in the drop down list. Finally enter your care home / hospice registration code and select ‘Register’. You may need to see your employer to get this code. If your employer does not have a code, then they need to contact the e-LfH Support Team. The Support Team can either give the employer the registration code or arrange a bulk upload of all staff. Access to e-LfH content is available to all social care professionals in England whose employers are registered with the Skills for Care National Minimum Data Set for Social Care (NMDS-SC). Every employer providing NMDS-SC workforce information to Skills for Care has been given a user registration code for their staff. This code enables you to self-register for access to Improving Mouth Care. Please contact your employer for more details about the registration code. For information about registering your organisation with the NMDS-SC your employer should access www.nmds-sc-online.org.uk or contact the Skills for Care Support Service on 0845 8730129. If you have a registration code, you can register by clicking here. The Improving Mouthcare programme is also available to NHS healthcare staff via the Electronic Staff Record (ESR). Accessing this e-Learning via ESR means that your completions will transfer with you throughout your NHS career.